Washington DC hasn't exactly been a hotbed of power pop, but it's getting there. 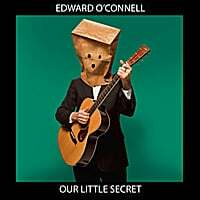 Lately we've heard from Vegas With Randolph and The Secret Pop Band, and now we have Edward O'Connell. You can't judge a CD by its cover, but in this case you know you're dealing with someone who has an appreciation for classic power pop as the cover is an homage to Nick Lowe's seminal Jesus of Cool (retitled Pure Pop for Now People in the USA so as not to offend delicate American sensibilities). And while it would be hyperbole to say O'Connell's Our Little Secret is another Jesus of Cool, I can say that it honors the legacy of the Lowe classic and is one of 2010's best power pop releases to date. Lowe is an influence here, as well as other power pop/classic rock touchstones such as The Byrds, Big Star, Elvis Costello and Tom Petty. "Acres of Diamonds" opens the album in an assured fashion, a jangly midtempo rocker that's instantly likable. "I Heard it Go" is another winner, a roots rocker that channels Marshall Crenshaw, and "Partially Awesome" and "Happy Black" have the lyrical snarl and the Beatlesque feel of Elvis C tracks circa the period he collaborated with McCartney. Elsewhere, the uptempo "With This Ring" raves on, the gentle, jangly "Pretty Wasted" makes nice use of Jill Read's harmony vocals, "Your Ride is Here"'s title conjures Warren Zevon's "My Ride's Here" and resembles Zevon in balladeer mode, and the clever and catchy "The Hardest Job in the World", another Elvis C-inspired tune. The most impressive thing about this album is the uniform quality of the tracks - not a bum steer among the 13, including the ones not highlighted above. Definitely in my top 10 for 2010 so far, and it should be in yours.